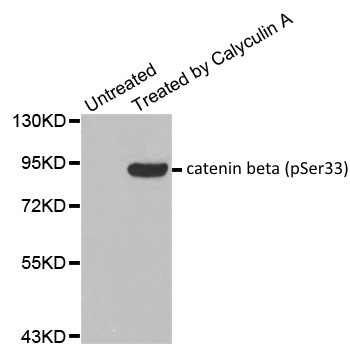 Rabbit anti catenin beta (pSer33) antibody recognizes catenin beta, when phosphorylated at serine 33. Catenin beta is a component of adherens junctions protein complexes that are involved in cell adhesion and actin cytoskeleton organization. Catenin beta also plays an important role in the canonical Wnt signaling pathway. Catenin beta is phosphorylated by either GSK-3β or homeodomain-interacting protein kinase 2 (HIPK2) at serine 33, leading to the degradation of catenin beta (Sadot et al. 2002, Kim et al. 2010). Antiserum to catenin beta (pSer33) was raised by repeated immunization of rabbits with highly purified antigen. Purified IgG was prepared from whole serum by affinity chromatography. J Cell Sci. 115 (Pt 13): 2771-80. Biochem Biophys Res Commun. 394 (4): 966-71.